We often have the best times when our timing is all wrong. For our anniversary yesterday, we had decided to take the train from Brunswick to Rockland, enjoying the ride in the old time cars, and then walking to The Brass Compass for the Lobster King Club sandwich (which is to die for good and probably one of the best kept secrets of lobster sandwichdom in Maine). We were late getting out of the house, but would make it in time for the 10:00 departure, however my husband discovered that he had no handkerchief, nor tissues, and his nose was running like a faucet due to some newly blossomed weed evidently. So we had to stop at Reny's and grab a new batch of handkerchiefs and some tissues for good measure. And decided to take the train from Bath instead, as it left there at 10:25 and we were right there, early now. We went inside the train station that sits by the bridge over the Kennebec River and next to the Bath Iron Works, wandering around and waiting. A few other people came in, picked up brochures from the Visitor Information Center there, and left. I finally went up to the counter to check to make sure we could buy tickets on board. The kind, but not from Maine, volunteer spoke with a foreign accent as she told me "Oh, no. There are no trains on Mondays." How did I miss that? Oh, maybe because I am fumbling with sunglasses, bifocals, print size on my iPhone and two disparate eyes - that's how. Okay, so our anniversary trip has suddenly been cancelled. What to do? Go with the flow. Improvise. Make it up as you go. Do something else completely. Wing it. So we wung it. We just started driving, looking and thinking, and making it up as we went. On Sunday I heard of a nice lobster place in Sanford, but what was its name? I had to text someone to find out. Yeah, Shain's - ooh, Shain's also makes ice cream. It's about an hour or so away. 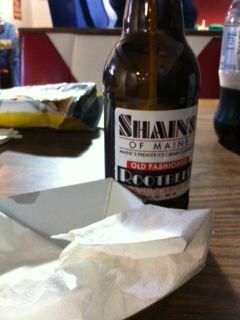 So off we went to Shain's of Maine, for a $5.99 lobster roll, the way it should be - not too expensive. I had a Shain's Root Beer with it. Even the sodas were only $1. I tried to take a picture, but I ate it before I could snap one. I didn't even remember to take a picture of the chocolate chip cookie ice cream sandwich for dessert. They were both very good. Then we continued our drive, south to Kennebunkport and looked at the ocean as we drove by. We couldn't stop, though there was plenty of parking. As a non-resident, we needed a $15 parking pass for the day from the town office. It isn't free until September 15. It was a beautiful drive though. We almost stopped at the grocery store and picked up steaks to take home, but before we could do that we changed our minds again and headed farther north and inland...all the way to Farmington. We stopped on the way for some crackers and soda and iced tea to tide us over. 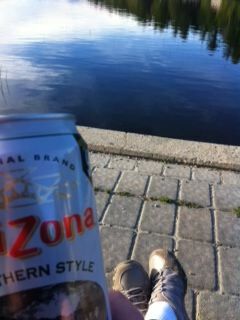 anyway -yes, sip our drinks and relax, watching the water and boats being launched into the lake for fishing excursions. It was a great, relaxing time as the sun was going down. Wow. It just doesn't get any better than this. We finished our drinks and got back in the car, heading into the college town for some real food. I really wanted to find a place with some atmosphere; not a college hangout, but we'd take what we could find. As we drove through the town, I spied a "storefront" restaurant that looked like it had candles on the tables. So we went around the block once to find a spot to park and go in. It was just what I was looking for, even though it looked as if it had been a Woolworth's in it's former life. It was quiet, with subdued lighting, candles, and a nice menu. Just before our meals came, a woman began playing medleys of relaxing music on a baby grand piano. Wow. What an awesome surprise! We had been talking about what movie we might like to watch when we got home and couldn't come up with any ideas, so I texted my daughter who is a library of obscure but great movies. She gave us some ideas. And then I got a text from her saying before you get a movie, check your email. So I checked my email. She had sent us a gift card from iTunes to buy or rent movies - our anniversary gift. Nothing had gone as planned today. We ran out of time to see a movie last night. 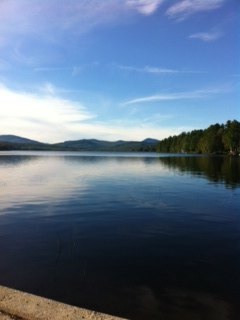 But next Saturday we are taking the train to Rockland, and getting a lobster roll or club sandwich at The Brass Compass. And then we will come home and watch a movie. Sometimes I think we're so conservative we're radical. Happy anniversary to us! 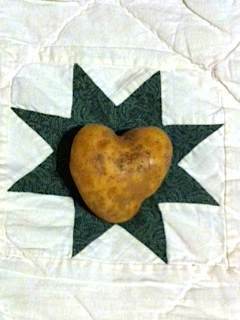 Said Quilt to the Potato, "Seams that you have your eye on me!" A friend of mine at college had locked herself in her room, threatening to commit suicide. She finally let me in. I talked to her for hours in that dark room that night. No one told me I couldn't counsel in a life or death situation, so I did. Everything turned out fine. My dorm mother, who didn't really know me before this, suggested that I apply for a Resident Assistant position that was opening up for the Fall Semester. I did, and I was hired. That night was a turning point for my friend, but it also changed the course of my life, and that one special guy that I didn't even know yet. In the second week of September, at the beginning of my Junior year in Child Development, I, an antique dealer's daughter, met my "husband to be", a potato farmer's son. He was a Senior in Electrical Engineering, and we were both Resident Assistants in neighboring dorms. We met at the first Resident Assistants' orientation meeting the week before the rest of the students arrived. He saw me and decided to ask me for a date. I was seeing someone else at the time, but decided to get to know this farmer. I broke up with the someone else a few days after meeting my future husband. By Christmas we were engaged. We were going to wait to get married after I graduated, but decided in July that we'd get married before school started again in September. We figure it was pretty nearly a year to the day after we first met, that we married. No one told us that it couldn't or shouldn't be done in that amount of time. No one said you should get to know them longer before you get married. We knew each other just fine. We decided on September 9th, a week before classes started again, to get married in a little church we'd never even attended, but was near the campus. It looked nice, so we went with it. I found a pattern and made my wedding dress and veil, and helped bridesmaids make their dresses using the same pattern in different colors. No one told me you didn't make your dresses, especially your wedding gown, so I did it. We ordered three marble cakes - round, in different sizes - from the local bakery. I stacked the cakes and decorated them myself, though I'd never done a layer cake and had never decorated anything but family birthday cakes, kind of. But no one told me that I needed a professional, so I did it. I hand-wrote my 100 wedding invitations, envelopes and reply cards. I learned basic calligraphy so they would look nice. We didn't have computers and printers. I didn't know it would be too much work for one person, so I did it. I carried a single yellow rose for a bouquet, and made candles for the bridesmaids to carry for our evening ceremony. Not much of a bouquet, but just right, and candle making was big back then. So "ta-da"! Did it. We had tuna, chicken and ham finger sandwiches and chips and pickles and olives and fruit punch that the ladies of the church prepared. No one told us that wasn't fancy wedding food, so we ate it. Everyone sat in folding chairs and held their plates in their laps and set their cups on the floor. No one told me that we should be sitting at tables, so everyone was able to mingle and chat and move about happily. Except for paying the preacher (which we'd totally not thought about, and my father did), we paid for the whole thing out of our own pocket. No one told us that the bride's parents typically paid for the wedding. I did not expect them to, and I would not have wanted them to. So we did it out of our summer job earnings. Including my dress, invitations, candles, cake and food, I think our wedding cost almost $200 back in 1972 (which was still not much back then for a wedding - maybe two months' apartment rental payments). I quit my first teaching job mid-year, so I could go with my husband out to Wisconsin where he'd gotten another job, after quitting his first. No one told us it would be a bad idea to quit jobs. When we got to Wisconsin, we got new jobs and bought our first home - a little ranch with attached garage in a little development. It had heat, water, carpet, 1200 sq.ft, 3 bedrooms, a garage and a nice big basement. We sold it in less than a year. No one told us it would be best to live in your new home for a lot of years and build up equity before you sold it. Instead of the ranch home, we now had a 40 acre farm with a 600 sq.ft. unheated one bedroom stone and stucco home on it (well, there was electric heat in the uninsulated shag carpeted kitchen). We heated the house with wood after finding out how expensive it was to heat the kitchen with the electric baseboard. There was only an electric space heater in the bathroom. Sometimes, if we came home late, there was an ice skim on the water in the toilet. Those nights I slept with my down jacket on until my husband could start the woodstove and get it a little warmer than the evidently 32 degrees it was. I wonder how we didn't freeze the pipes? Oh, yeah. No one told us it was a bad idea to let the house get so cold. Do we even need to discuss the scritch-scratchy bats living upstairs between the ceiling and roof, the mouse droppings in the kitchen cupboards, those cute mouse-sized (with just as much hair as a mouse) spiders and the transparent snake skins in the basement...it was a very, very old German farmhouse. No one seemed as impressed with this home as we were. It had 40 acres! It had a barn! We could have horses! And we did. We didn't know anything about horses, except that I liked them and had always wanted one. So we had ten. 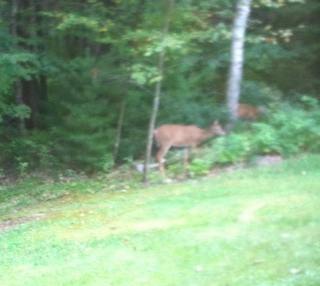 And some rabbits. And a few dogs and a couple of cats. My mother-in-law was worried that she would never have pictures of grandchildren. I'm sure my parents were concerned, too, but they never said a word. No one told us we should hurry, so we didn't. When we were about to have our 1st child in our 7th year of marriage, we built a new home on the same property, about 100 feet from the old house. This new house was "taken" by a twister when it was framed in and roof on, scattered around the county in the valley below us. We thanked God we hadn't been ahead of schedule. We rebuilt it. The day after we moved out of the old house, the chimney collapsed onto the floor right where our bed pillows used to be. We thanked God we were not behind schedule. I had two totally natural childbirth experiences. We were in the hospital, but in a low key, natural birthing room - brass bed, sheets with yellow roses - no meds at all. And finally baby pictures instead of cat pictures for our parents. We moved shortly after our second child, a daughter, was born. We again quit good jobs. Would it have mattered if someone had told us you shouldn't quit jobs with two little children? Probably not. Though we loved Minnesota (just across the Mississippi from our jobs in Wisconsin), we wanted to be closer to family. We ended up in NH for a bit, and then RI. When our home was broken into in the middle of the day and my husband was out of town and I was taking our youngest to preschool, we determined that we would move out of RI and go straight to Maine, where family was and where our roots were. We bought a home in a fairly busy neighborhood. We liked the house, but it wasn't ideal. We would live there while we looked for a better place to settle down. Then we proceeded to live there for 10 years! Yikes! We hadn't realized that time was marching on. We bought a 5 acre parcel in a rural, wooded development close to the ocean. Then we planned out how to accomplish this next build and move. We decided on a log home, which we chose to build when we were describing our two options for homes to our teens. As I described the houses, I told them option 1 was a log home, with huge windows and cathedral ceiling, and option 2 would be very much like the house we were in at the time, a cape...as soon as the words came out of my mouth "very much like this house", my husband and I looked at each other, and we knew that would not be the house we would build. It was time for different than anything we'd done before. Living in this spot, in this house has been wonderful...even with the year (well, 11 months) that we had to leave it while a major soot cleaning was done after a fire. We lived in a motel for all that time, and realized that our little stone house in Minnesota had been big, and that we didn't need half the stuff we had. Okay, more than half the stuff we had wasn't necessary. With one three-foot wide closet that housed our clothes, an ironing board and an iron...oh, and a 1 foot tall Christmas tree... we realized that we had too many clothes in our life, and too large a Christmas tree in our garage. Life was about life, not stuff. And now we are about the business of doing something totally different again 14 years after building. We are renovating an old house, not much bigger than that old farmhouse in Wisconsin. When we first saw the house, it was being used for storage. It had no heat, no bathroom, no insulation, no chimney. It had old paneling that was rippled and falling off. We have given it new everything, except the skeleton. It is no longer a gray cedar shake exterior, but sporting cheerful yellow cedar shakes with a touch of green in the peak, and a vibrant day lily orange-red front door. We have included some radical new ideas for the inside. First, there will be no falling down chimney...no chimney at all with propane and radiant in-floor heat. Other radical ideas: two dishwashers (one for clean, one for dirty, no intermediate cabinet storage), toilet tanks in the wall, toilets mounted to the wall (for easy under and around cleaning), a washer/dryer combo unit (no, not one up, one down - one unit that does both). Then for ambiance all wood floors of full 20' length fir, rejuvenated interior doors and hardware, stained glass ceiling and sconce lighting. I am excited to be able to live there. I have retired. My husband will be retired in another year and a half. We have two wonderful grown offspring. Our son has bought a house and it's so exciting to see him working on it. My daughter and her husband are living in a home pretty much like the old one we lived in, but are looking ahead to a larger house now that Grandson is moving around - a lot. Oh, and they are expecting their second child in May. Happy anniversary! 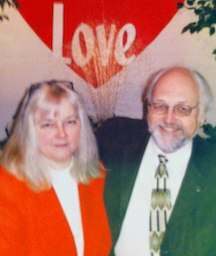 I'm glad my husband-to-be, became a husband-to-me! I pray that things move along not too fast and not too slow...that we are always in the right place at the right time in our lives. when you are radically in love. No one told us it wouldn't last, so we are forever together. Hope everyone is having a great start to the school year. It's the first day of school here in our town. I'm going in town for cookies and tea with another retired teacher friend, so that we can watch the buses leave the schools and take kids home on their first day. It is still fun to watch the first day excitement. Oh, the end of the first day in first grade...can't say I miss that! "How am I getting home?" "It says you are on bus 21." "The same one you came on this morning." "My mom drove me to school today." "Don't worry, we will get you to the right bus." "I think my mom is picking me up." "I don't have a note from her about that." "Oh, yeah, it's in my lunchbox." "No, she's not, the note says today you need to go on whatever bus will get you to your sitter's house..."
I came across my notes for a poem for March Madness 2013 and reworked some of the lines. We saw two owls a few weeks ago in a tree on our front lawn. They flew off as I was trying to focus a camera on them. I love seeing owls. They remind me so much of cats. Flying cats. Another poem for another day. His question was always the same. Why befriend "what's his name"
Of course, owls don't really chew, but rather tear and swallow...but it doesn't rhyme. I guess I could have used a bit more poetic license and said "swallooo". I'm having one cataract done tomorrow! And the next the first week of October! That will perhaps make it easier to read blogs and write my blog again. Looking forward to that! Though these glasses helped me see better than I could before, my right eye has continued to get cloudier, and it isn't easy to read with or without glasses on - so I've slacked off a bit. Looking forward to "seeing you" again!